My husband and I wouldn’t go anywhere else!  Home » testimonial » My husband and I wouldn’t go anywhere else! 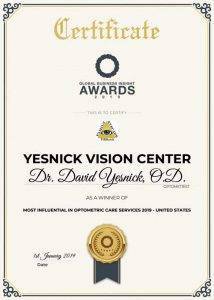 My husband and I are both VERY pleased with Dr. Yesnick’s care, and his staff! All are very professional, warm and friendly. The office is nice, clean and modern. 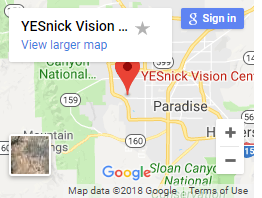 The area for choosing glasses is a bit small. It only accommodates 2 people sitting side by side at a table, trying on glasses. So, if others are waiting to select glasses, you feel a little hurried. NOT by the staff.. they are wonderful, and very patient! But, just the situation of having only 2 seats, makes you feel that you’re holding up the others that are waiting. This is the first time I’ve ever needed glasses, so I had no idea what I wanted, and I know I spent a LONG time deciding on 2 pair. But, since it’s not an inexpensive purchase, and something you have to wear everyday… I didn’t want to rush through the decision. As I said… NO ONE rushed me! I just felt like I needed to “speed it up”, so someone else could have my seat at the table. But, with all that said, my husband and I wouldn’t go anywhere else!